Ace gospel singer, Ernest Dades has lost his brother in-law and backup singer, Ritji Joseph Yakzum. Junior as Ritji was fondly called was Dades' baby singer in his 2003 hit song video, "Tauraro". The Dades' wife's younger brother has been a passionate gospel singer and instrumentalist since his involvement in the piece. He recently led a stunning gospel music ministration in Ghana, his last major outing before his demise. 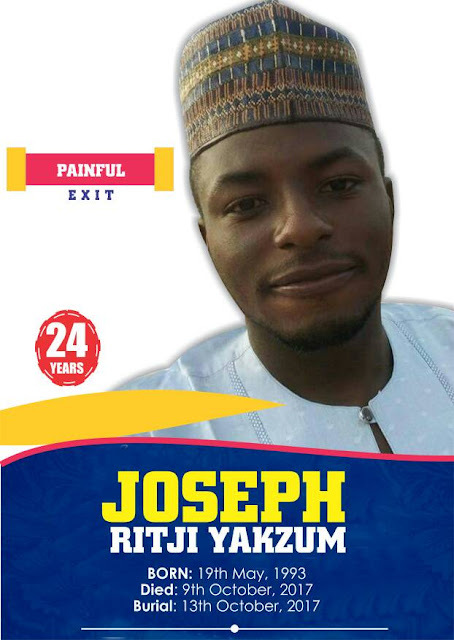 Born to the family of Nde G.G.Yakzum on the 19th day of May,1993 at the Jos University Teaching Hospital J.U.T.H, Ritji was the sixth born in the family of five boys and a girl. He started his educational career at Educare Private School before joining Sekel Missionary Academy Jos from. Junior then went to Ghana to further his education at Zenith University Accra in Ghana. Junior was baptised on the 24th day of November, 2006 by Rev. Dr. Sylvester Dachomo at COCIN State Low cost,Rantya Gyel. He was an active member of the COCIN State Low Cost Church Band. He was the worship Leader during the Independence Day Celebration in church. He died, Monday, 9th October 2017 after reportedly battling with diabetes for some time. Junior was a complete gentleman who was always smiling with everyone, according to a family statement. Emmanuel G.Yakzum (brother), many cousins,uncles,aunties and Friends.